The Toronto Dingos hit the road for a second week in a row, this time travelling down the QEW to visit the Hamilton Wildcats for the second match of the 2018 AFL Ontario Season. The weather was absolutely perfect for footy - mildly overcast with just a slight breeze at Mohawk Sports Park - and a full squad (plus a bench!) made the journey to don the Red and Black. Unfortunately for the home squad, the numbers weren't as strong, so the Dingos agreed to match at 14 men on the field out of respect for the many times the Wildcats had matched to our own short numbers. After a quick lineup shuffle and tweaking of the gameplan, the squads lined up for the opening siren and the game was on. Returning to action for the Dingos was non other than club hero and secret rockstar Tom Bell, who was playing in his 100th game for the Red and Black - pretty much all of which have been in the Ruck. Tom Bell's dominance in the Ruck was noticable from the first tap, as the Dingo midfielders looked to use the advantage of Tom's rucking and push the footy forward to the main scoring targets, Rob McNaughton and returning Dingo Stefan Cosma, who was playing in just his second game for the club. Consistency proved to be an early issue for the Red and Black, who would put together 10 minutes stretches of efficient, accountable, aggressive footy (and pop in a few goals), then follow up with some lazy stretches of poor decision making that put the backline under the pump. 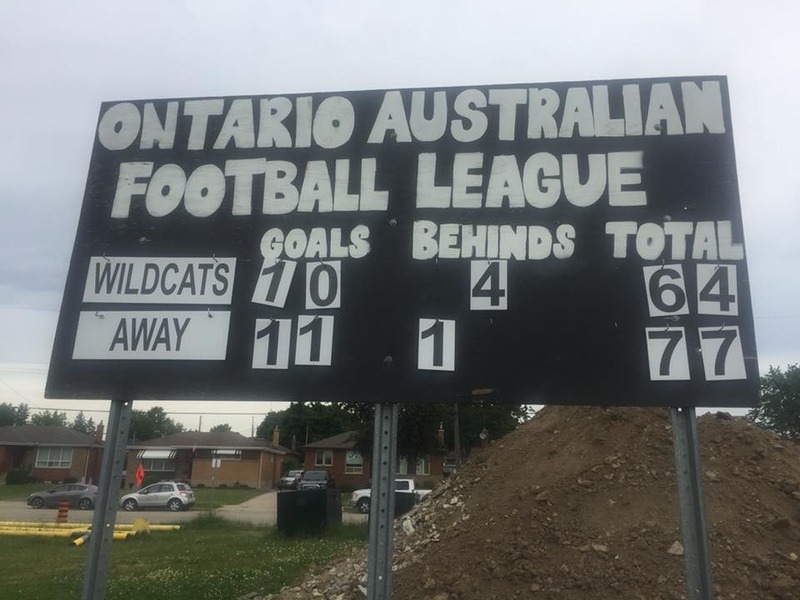 The Wildcats were smart with the footy, using the familiarity of their homeground to their advantage and targetting their big guns to efficiently move the footy, and everytime the Red and Black would pull ahead, the home squad would respond. This put the backline under pressure to hold, and some timely clearances from Tim Indian and Alex Cataford were as crucial as every goal kicked by the forwards. But in the end, it was the Dingo half-back line of Ben Moller, Dan Gunn, and Justin Robertson that made the game saving plays late in the third and fourth quarters. Whether it was the two key one-on-one victories by Gunn, or the late-game leather poisoning Benny Moller must have developed after all those disposals, the half-back line firmed up at the crucial moments of the fourth, as the Wildcats made a last push to take over the lead. The final siren was finally blown, and the Dingos had claimed a well-contested 13-point victory. Congratulations to another first-gamer Piotr Makuch, and shoutout to wiley vet Mick McFarlane, who made the journey down the QEW to lace one up with the boys. Next up, the Dingos will square off against the Etobicoke Roos in the lone friday-night game of the season.